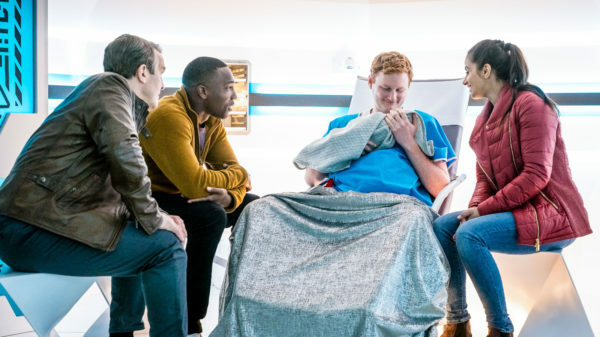 Posted November 5, 2018 by Andrea Laford & filed under Episodes, General, Reviews, Spoilers. The Tsuranga Conundrum is very engrossing episode, from the siege situation, to the ailing hero fighter pilot, to the companion relationships, to the pregnant man. While previous narratives have covered similar subject matter, The Tsuranga Conundrum had a very fresh take on it. 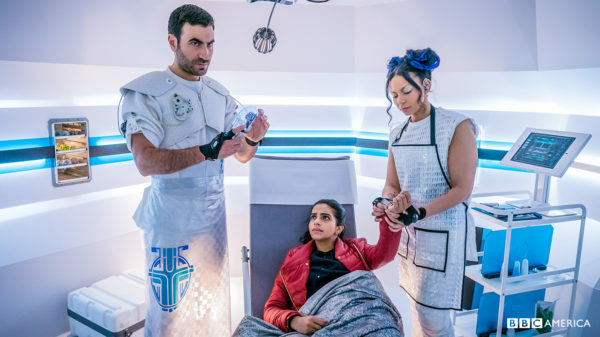 The junkyard planet where the episode began was merely a plot device to put the Doctor (Jodie Whittaker) and her friends in a 67th century hospital ship, but once in the the gleaming white spaceship setting, the episode really took off. 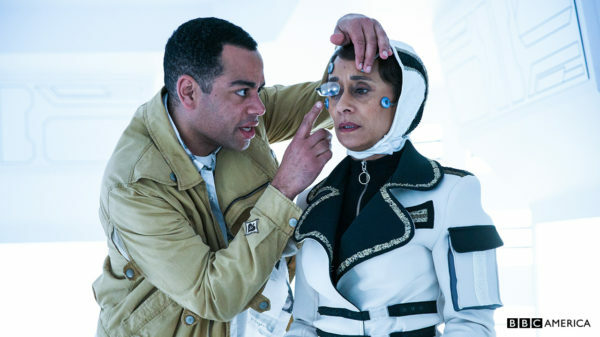 At once we meet the two medics Astos (Brett Goldstein) and Mabli (Lois Chimimba), the hero fighter pilot Eve Cicero (Suzanne Packer), her mechanic bother Durkas Cicero (Ben Bailey-Smith) and her android “consort” Ronan (David Shields). The term consort could be construed as an intimate partner, a companion or an associate. This choice of words makes Eve’s brother Durkas uncomfortable and adds another interesting layer to the scene. 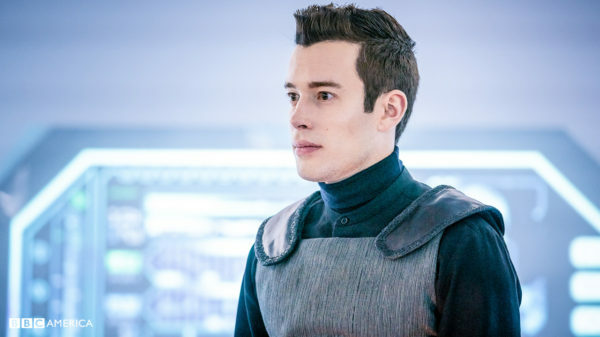 The way the new characters were introduced felt very paced, deft and entertaining, especially with the two heroes of The Book of Celebrance, Eve Cicero and the Doctor. The introduction of the main threat was skillful, with an unknown entity breaching the shields. When the entity was ultimately revealed as a very twee-looking Pting, one could be disappointed that it didn’t have a more menacing appearance. One could also wonder if the creature was created with merchandising in mind. 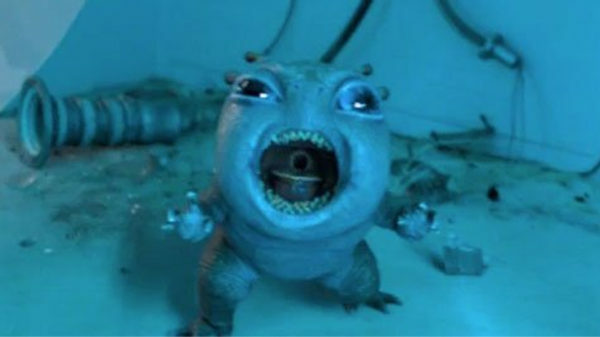 Having read an advance review before seeing The Tsuranga Conundrum, I was prepared to experience some disappointment but found I could accept the concept that a creature with a cute appearance could also pose a grave threat. And it did prove to be deadly when it encountered its first Tsuranga passenger. The disparity between cutesy appearance and grave hazard is very interesting and appropriate, especially since the Pting is motivated by relentless, insatiable hunger and not malice. One standout point in the episode is when the Doctor admits to Astos that she is only thinking of herself when she insists on retrieving her TARDIS. I can’t think of another Doctor who has ever made such an admission or conceded a point so gracefully. 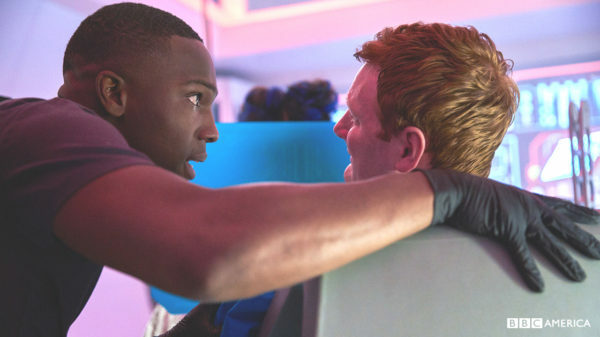 After the letdown of a weak resolution in Arachnids in the UK with its unsatisfying character interactions that felt cut short from full emotional impact, the scene in The Tsuranga Conundrum where Yaz (Mandip Gill) asks Ryan (Tosin Cole) about his relationships and experiences with his family members helped immensely to give a better idea of Ryan as a character. 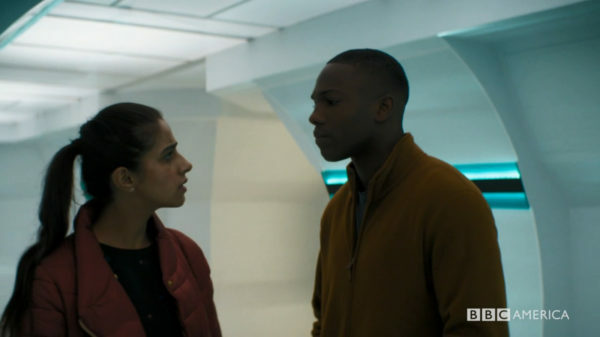 We were also once again treated to Yaz’s tactful, considerate manner which helped her solve the parking dispute in The Woman Who Fell to Earth. These few lines of dialogue helped flesh out the two young regular cast members in a way that made them feel more real. The narrative switched between defensive efforts against the Pting and a storyline with a pregnant man in labor. The pregnant man narrative is not as alien to contemporary experience as one might think. Several trans men have given birth to children and while a few of these cases have garnered a lot of attention, most don’t. Yoss Inkle (Jack Shalloo) isn’t human so his experience, while undesired at first, isn’t unusual for a Gifftan male. It’s refreshing to be introduced to an alien humanoid species where both genders share equally in childbearing. Graham (Bradley Walsh) and Ryan’s willingness to be his support is very touching and while there was a lot of humor to be found in their reactions, the situation was thankfully not played as a farce. There are episodes of Doctor Who that are very polarizing in the way fans react to them. The Tsuranga Conundrum could be just such an episode. I’ve already read two negative reviews. You may agree with the negative reviews and that’s okay. There may be a previous or an upcoming episode you enjoy more. There was so much to admire about the way the passengers of the Tsuranga handled their joint and personal conundrums with grace under pressure. Ronan’s incantation for Eve Cicero at at the end was very moving. I like this Doctor of Hope.